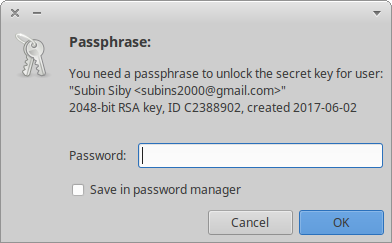 I got into Debian packaging and one of the most brutal part was to type in the GPG secret key’s password every time I sign a package. I wasted a lot of time typing my long password. I searched a lot to cache my password for some time after I type it once. All of them said to edit gpg-agent.conf, but none of them worked for my fresh installation of Xubuntu 16.04. I’m writing this to save you a lot of trouble. Seashore is a great application to manage your keys. I’m asking you to install seashore as it comes with a graphical pinentry tool. This is the secret sauce I’m going to give you that might solve your problem. This is what worked for me. This makes gpg to use an agent to enter passwords. and after you enter it, it’ll be cached according to gpg-agent configuration file. Variables in Bash ": command not found"